Reduce your surgical gowns codes by 40% while you increase staff protection and comfort – with new AERO SERIES* Gowns from Halyard Health. NEW AERO CHROME* breathable performance surgical gowns deliver maximum AAMI Level 4 protection in critical zones with unprecedented comfort. 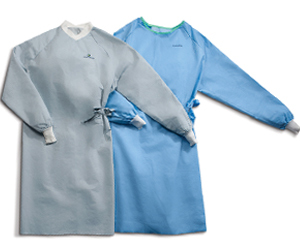 Light, cool AERO BLUE* Gowns ensure AAMI Level 3 protection. See how AERO SERIES* Surgical Gowns can help dramatically reduce gown management and your cost-in-use.